A sample business swot analysis has become mandatory for every business irrespective of its category or its present state. It can be done at the very beginning during the planning stage or even when a business is running to determine the outcomes and consequences for further expansion into new ventures. 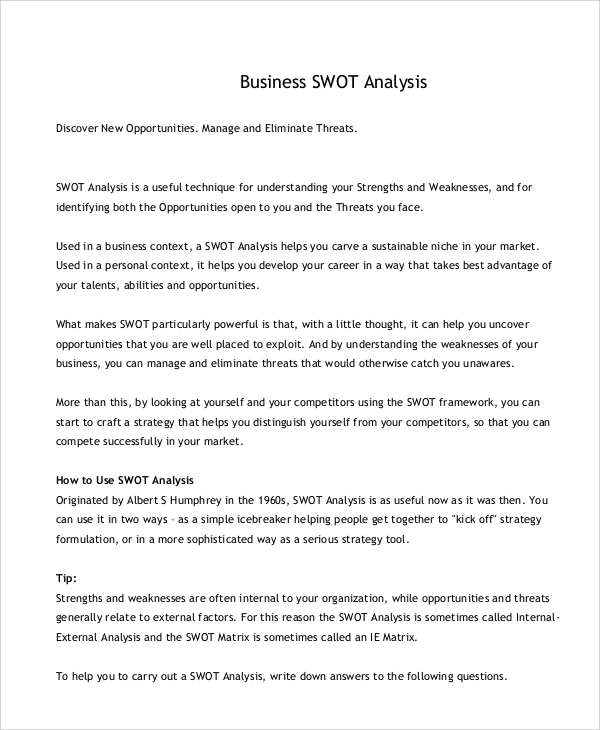 A SWOT analysis helps in understanding the strengths and weaknesses, opportunities and threats of any business idea or plan in advance.You can also see Business Case Analysis Samples. 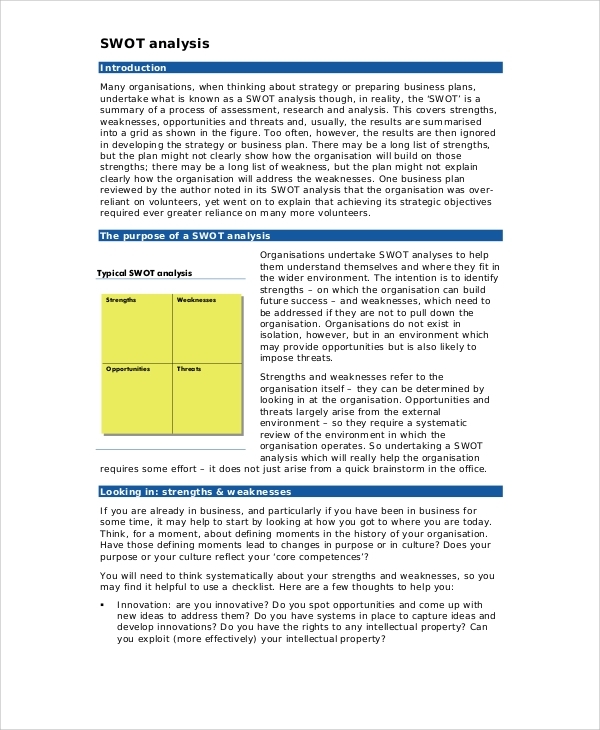 This is a proper manual for a SWOT analysis. 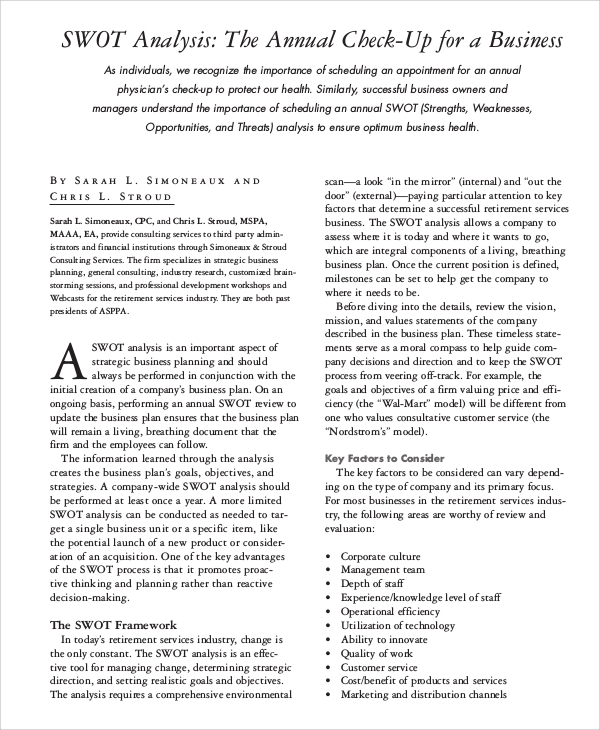 It states the concept of the SWOT model and gives step by step guidelines to use the SWOT analysis for any category of business. It indicates the parameters to be checked while listing the strengths and weaknesses of a business. It provides a questionnaire to find out the opportunities and the threats to a business model in the upcoming future. 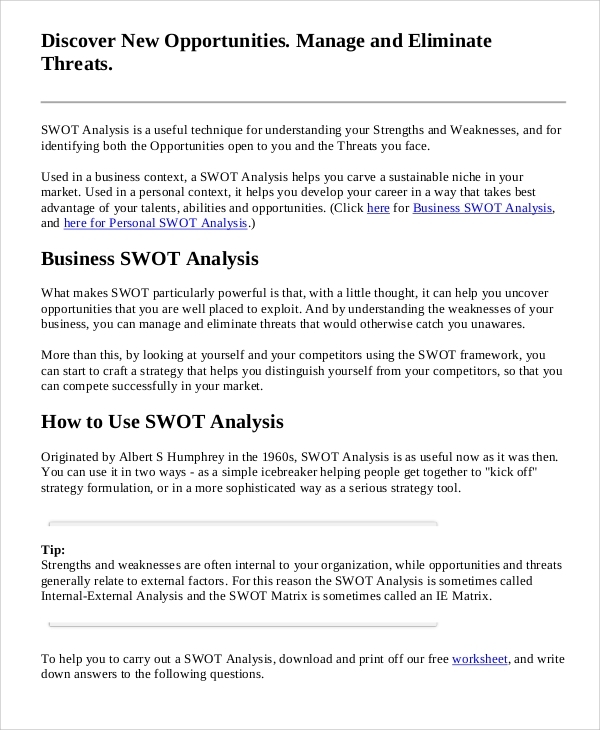 It also states how to conduct a SWOT analysis in future for better improvement. This is a sample SWOT analysis for any category of business. It has detailed guidelines to find out the strengths and weaknesses of a business, how to convert the weaknesses into strengths, where do the opportunities lie and what are the possible threats. It can be done in the planning stage of the business or even in the execution stage. It helps to understand the business in a better way to progress in short to long terms. 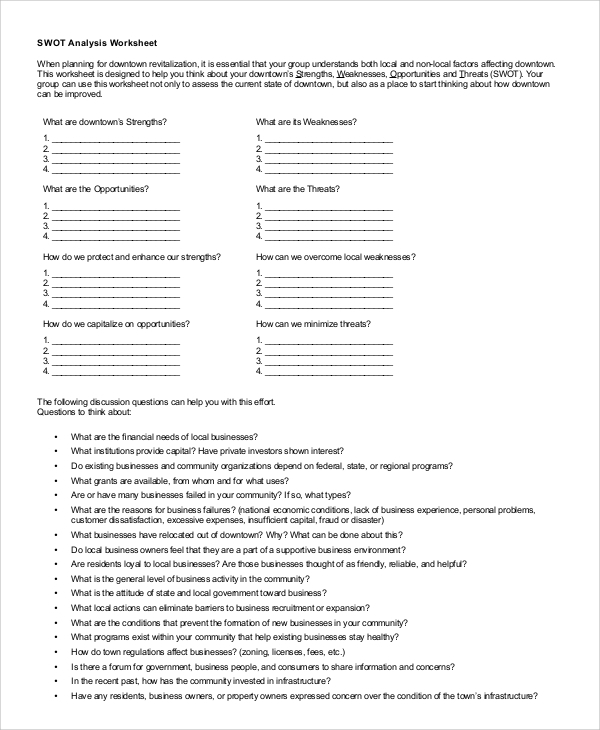 This is a complete manual for a business plan SWOT analysis. It is very useful when a business wants to expand itself in new ventures. It can help in deciding whether such plans are going to be successful in the long run or not. It provides step by step guidelines about how to conduct the analysis starting from the questionnaire to the formation of the team. It also states the approaches and responsibilities of the members of the team and draws tables and conclusion for the final report. 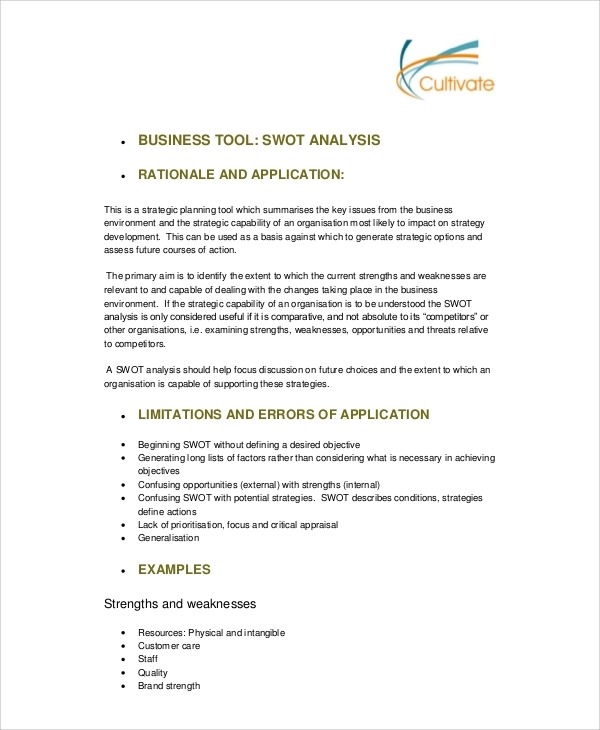 A SWOT analysis is the backbone of the success or failure of a business plan or idea. It is immensely helpful in determining the strengths and weaknesses of a business with detailed report. The above manuals for the SWOT analysis are having all the parameters and questionnaire which will help to determine the opportunities and threats in the near and long term future. Once the strengths and weakness are clear to any business, they can head in the right direction to excel and prosper. The targeted audience for such analysis is the owners and the management teams of a company who want to explore the opportunities for new ventures or who are planning to open a new business. A SWOT analysis helps them to understand the current scenario of the market and how relevant and demanding their ideas are. It clearly states the parameters for further growth and the unforeseen threats to the business.You can also see Business Analysis Samples. A SWOT analysis helps to identify new opportunities for an established business. It can help to make or break a business plan or idea by indicating its relevance and demand in the current market scenario. It safeguards a company from huge losses by indicating the potential threats for their business models. A SWOT analysis can be very handy to attract investors by providing them detailed reports of strengths and opportunities. It helps a business to improve its weaknesses to avoid disaster in future. A Swot analysis helps to understand the prevalent market condition and the relevance of a business idea or new venture in such conditions. It indicates the factors that can lead to success and failure of a business. It can be conducted any time and the above SWOT analysis manuals are tailor-made to prepare a SWOT analysis report effortlessly.